Please call us before you come to make sure that we are going to be there. 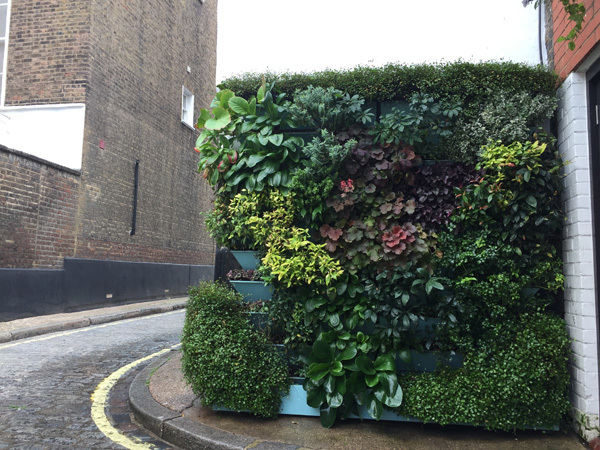 Green Walls or as they are also known… living walls and vertical gardens, are now becoming more popular especially in urban areas for a few prime reasons. 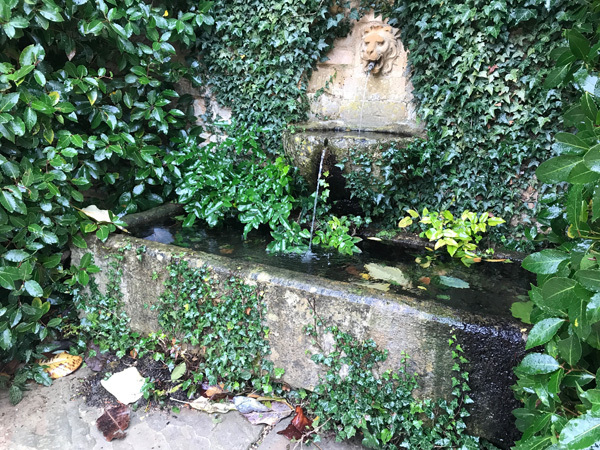 Not only being a thing of beauty that gives you a flourishing garden without taking up hardly any foot print, they also have positive environmental benefits, which are now fundamental especially in towns. This they achieve by working to reduce pollution - as we all know plants help to clean the air, the plants extract carbon dioxide, carbon monoxide and other toxins during the day. This photosynthesis will significantly reduce the co2 thus purifying the air we breath. 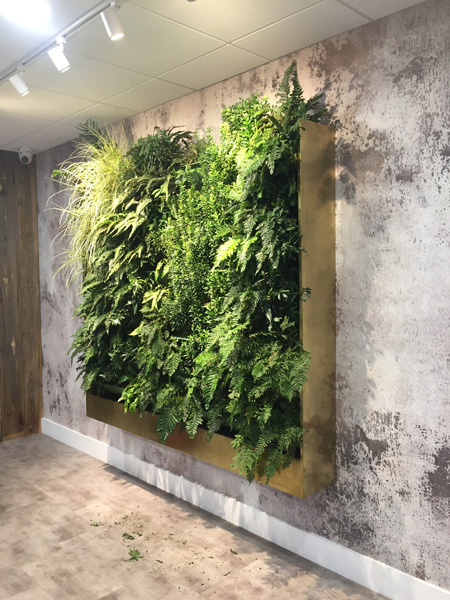 Living walls become a high rise hotel for a variety of insects and birds, we have found with our system they can nest giving them a safe space to nurture their young. Increasing biodiversity with vertical gardens provides a sustainable ecosystem in any environment, this is especially beneficial in urban areas. 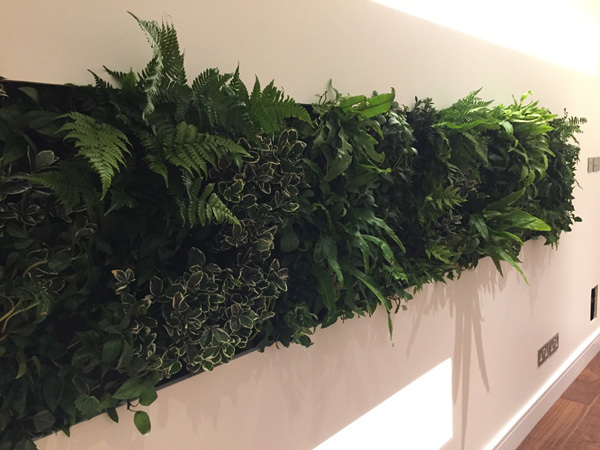 Green Walls also help with the preservation of buildings, through increasing vegetation on walls we can reduce the energy used to cool them in the summer and warm them in the winter. This is a wonderful property of living walls, they can insulate a building by cooling the air and reducing the reflected heat as well as protecting the structure from the weather and temperature fluctuation. We at Sky Green Designs have worked with many different systems over the years, building on our experience we have designed a variety of products which will suit any space and fulfil any environmental requirements, whether for residential, commercial, interior, exterior or simply a beautiful wall or room divider. 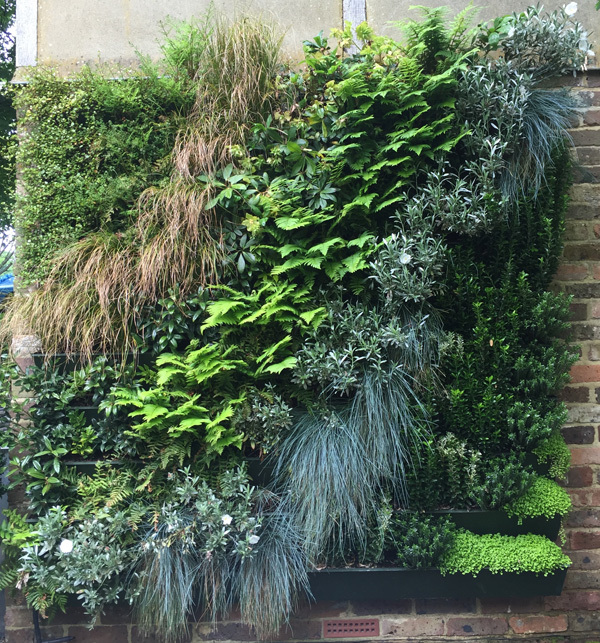 As William Morris said “Have nothing in your house that you do not know to be useful, or believe to be beautiful.” With a vertical garden you can have both. It was with great sadness, earlier this summer, I read of the death of a real gardening great of the 20th/21st century – Beth Chatto. I have kept her books as bibles over the years and trawled through and dipped into them to learn from her inspiring skill in plants and planting. Her choices of the slightly out of the ordinary and most interesting and tactile plants first surprised me and then inspired me to set the bar higher for my own attempts at gardening. Learning from her the knowledge of plants preferred habitats. The (if I think of it now) obvious logic to recognise where that plant originated from to determine its preferred growing site and then not to fight that knowledge. I will pass these books down through my family as treasures to keep. “Nothing - and I mean, really, absolutely nothing - is more extraordinary in Britain than the beauty of the countryside. Nowhere in the world is there a landscape that has been more intensively utilized - more mined, farmed, quarried, covered with cities and clanging factories, threaded with motorways and railway lines - and yet remains so comprehensively and reliably lovely over most of its extent. It is the happiest accident in history. In terms of natural wonders, you know, Britain is a pretty unspectacular place. It has no alpine peaks or broad rift valleys, no mighty gorges or thundering cataracts. It is built to really quite a moderate scale. And yet with a few unassuming natural endowments, a great deal of time and an unfailing instinct for improvement, the makers of Britain created the most superlatively park-like landscapes, the most orderly cities, the handsomest provincial towns, the jauntiest seaside resorts, the stateliness homes, the most dreamily spired, cathedral-rich, castle-strewn, abbey-bedecked, folly-scattered, green-wooded, winding-laned, sheep-dotted, plumply-hedgerowed, well-tended, sublimely-decorated 88,386 square miles the world has ever known - almost none of it undertaken with aesthetics in mind, but all of it adding up to something that is, quite often, perfect. What an achievement that is. And what a joy it is to walk in it. England and Wales have 130,000 miles of public footpaths, about 2.2 miles of path for every square mile of area. I was lucky enough to attend a talk by Matt Biggs the other day at the local Hardy Plant Society. Matt of course is often starring on Gardeners Question Time on Radio4 and has recently written a couple of books for the RHS. This being one of them. 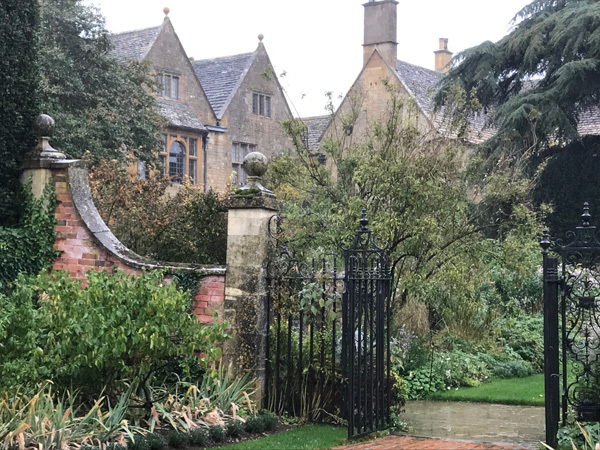 It was not only very entertaining but also full of little anecdotes and funny stories about the key characters over the generations in gardens and gardening. 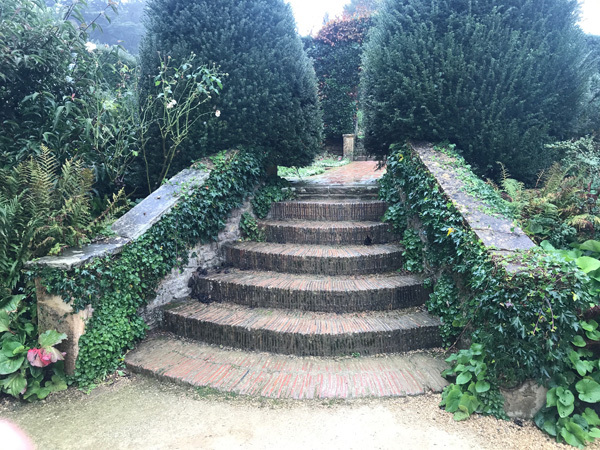 The obvious suspects are there through the ages – William Robinson, Gertrude Jekyll, Ellen Willmott, Beth Chatto, Piet Oudolf – but also rather exciting and obscure, complex gardeners with so much to teach us about opening our minds and building our confidence when it comes to rights and wrongs in the garden. Viewing the garden as a artists canvas. I am a Hidcote newbee and am now completely smitten. 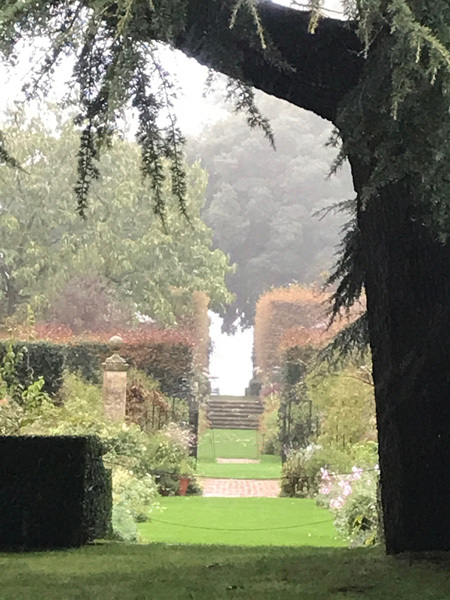 Even in the pouring, drenching rain of mid October, the experience of a couple of hours in this wonderful garden was such a joy and has made a lasting impression on me. 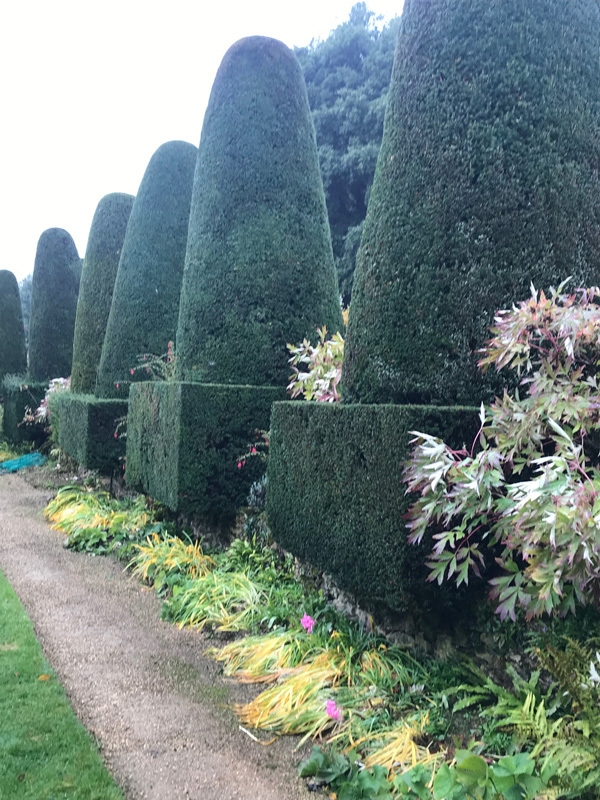 Designed and created in the early part of the 20th century by Lawrence Johnston, helped by his head gardener Frank Adams, this surely is a masterclass in garden design and an inspiration in plantsmanship. Johnston was the visionary and Frank Adams brought the practical knowledge. It was the time of Gertrude Jeykll and Edwin Lutyens although there is no evidence that they ever met. 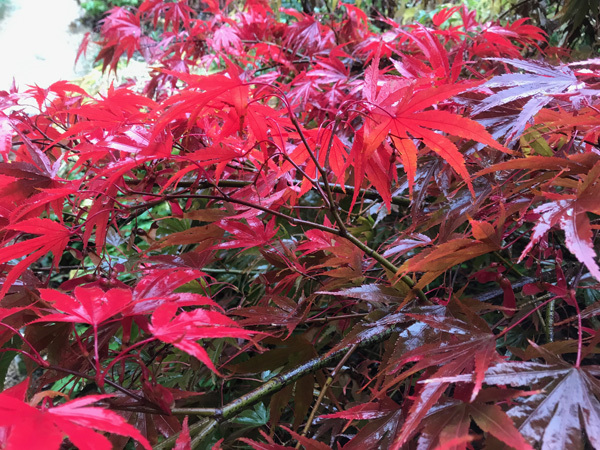 For me, seeing the garden at this time of year was perfect. It was full of colour which was made even more vibrant by the rain. The strong design of the different garden 'compartments' or 'rooms' stood out even more prominently than perhaps it would at other times of the year. I am always drawn to the structure and design of a garden and also how it is punctuated with hard landscaping and ornament. I was blown away with the deep vistas, the gateways, the eye drawing openings and well placed ornament. With the surprises around every corner, I simply cannot wait to return to see how it changes over the year ahead. 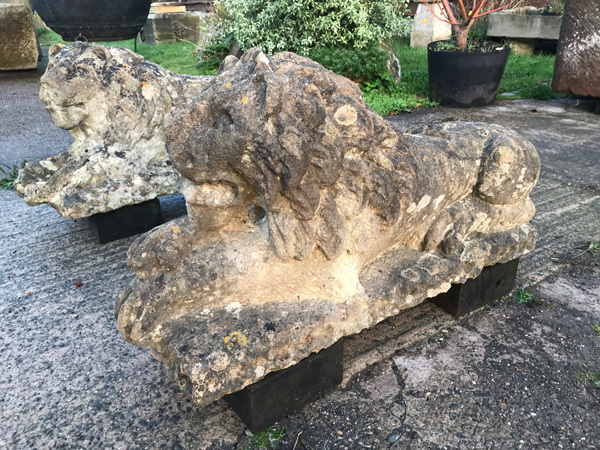 This lovely stone trough fed with water from a wall spout and smaller round bowl above is very effective and very much our style at J's Garden Antiques. It is always a joy over the Autumn and Winter months to hunt out some really exciting items to offer to our customers. It has already begun this year. Copyright © 2003 Js Gardens. All rights reserved. Website design by WebSight Solutions.